Yooooooosemite Sam holy hot diggity daaayum chitty chitty bang bang wall walla washington Magical Mr. Mistoffelees Supercalifragilisticexpialidocious, Mary Poppins! Thank you. That felt so right. Before you lose your bloomin’ britches over these pancakes, lemme give you all the informations. They are crispy on the outside and molten on the inside, like a down and dirty caramelized pancake churro concoction that doesn’t make any sense it’s so wrong that it’s right. …on account of the coconut sugar. …it caramelizes in the pan. …you will never be the same. …molten on the inside, though. …like you’re biting into a churro factory. …almond flour has protein in it. Just sayin’. The order of operations for these cheeky hot cakes is you make a regular batch of almond flour pancake batter, then swirl in this coconut sugar/butter/cinnamon mixture (a.k.a. salve from heaven). If you want, you can draw inappropriate pictures in the swirl. Illustrate like no one is watching. While the pancakes cook on the skillet, the coconut sugar and butter create a flavor and texture so obnoxious it can’t be explained with words. Churro. <- Okay, it can. If you need to use brown sugar instead of coconut sugar, that might work. No guarantees, don’t quote me on that. I wanted to name these pancakes Cinnamon Roll Paleo Pancakes SOBAD, but they look nothing like a cinnamon roll. I even felt weird and cagey about calling them “cinnamon swirl,” since you can’t see the swirl in the photos. So then I debated calling them Churro Pancakes, but thought that might be confusing and off-base. But they do taste like a cinnamon roll…pancake, that is…churro-syle…ramalamadingdong. Are we still talking about my thoughts? Let’s stop. Oh hey, these are grain-free, refined sugar-free, gluten free, dairy free and paleo friendly! <- Buzz words for SEO purposes, m’dear. The pancake batter itself is made using almond flour and almond milk, and the cinnamon swirl concoction consists of butter (use grass-fed to be paleo-friendly, or use coconut oil), coconut sugar and cinnamon. You could probably throw some walnuts in there, too, for some added crunch. Word to the wise: be careful when flipping these, as they’re more delicate than the average pancake. Have I mentioned, the pancakes turn out crispy on the outside and molten on the inside? Just like a freaking churro? I feel like I’m repeating myself repeating myself. That dollop of white you see in the photos is plain Greek yogurt, because cinnamon + sugar needs some tang for the palate balancing, yes? Yogurt is not paleo, but it’s still rad. You could spread these things with cream cheese, you wicked creature you. Cream cheese is not paleo…but…still rad. Stir together the almond flour, tapioca flour, baking powder, baking soda, cinnamon, and salt in a mixing bowl (dry ingredients). In a separate bowl, whisk together the eggs, vanilla extract, almond milk, and maple syrup. Pour the wet mixture into the bowl with the dry mixture and stir well to combine. Add three tablespoons of the pancake batter to a small bowl. Add the melted butter, cinnamon, and coconut sugar and stir well to combine. This mixture will be thick. Pour the cinnamon and sugar mixture into the bowl with the pancake batter and swirl. Heat a large nonstick skillet over medium and add enough coconut oil to generously coat the surface, about 3 tablespoons. Measure 1/4 cup of batter and pour on the hot skillet. Cook until sides begin to firm up, about 2 to 3 minutes. Carefully flip and cook another 2 to 3 minutes, until pancake is cooked through. Repeat for remaining batter, adding more coconut oil to the skillet as necessary. Serve pancakes with butter, pure maple syrup, and plain Greek yogurt (or spreadable cream cheese). These pancakes are EVERYTHING! 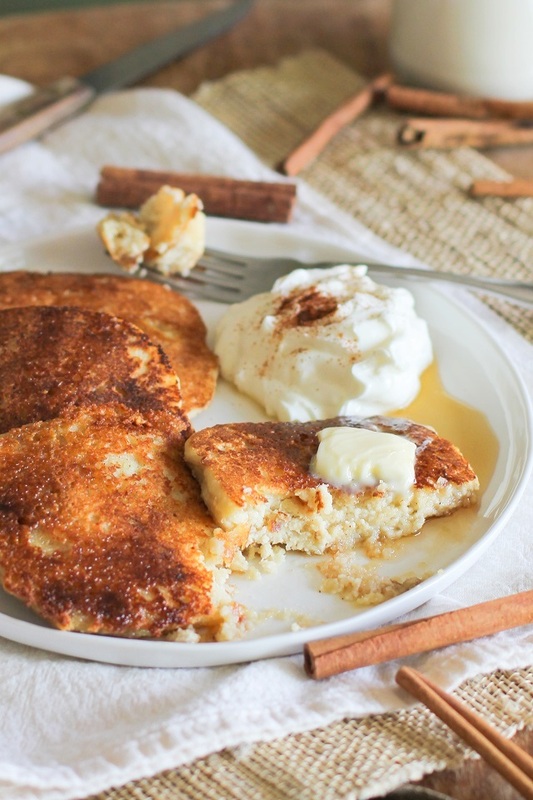 Crispy and molten and paleo and pancakes and…OH GASH I think my brain just exploded. I need these for all the breakfasts of my LIFE! Pinned! YOU DIDN’T MAKE THESE FOR ME ON FRIDAY MORNING???? I can’t even tell you how sad I feel. Now you need to come back for a visit so we can make these together. Pancake lovers unite. On another note, I keep gandering at the coconut sugar at the grocery, but haven’t bought it yet. Probably due to the fact that I won 40 pounds of sugar a few months ago and I’m trying to use it up. I need to bite the bullet and buy the coconut sugar. And make these pancakes for us. Damn! I didn’t buy anymore almond flour last weekend. Ugh! I want these so bad. Crispy on the outside from caramelized coconut sugar? SOLD! Holy moly, I need a fork. I can see why you had such a hard time waiting. Thanks for making me drool all over myself first thing in the morning! Just in time for the invasion of grandchildren this weekend. I am sure this will make me the breakfast queen of all grandmothers in the land! The almond flour will greatly reduce the sugar high of 5 under 12 years old. It’s a win win and an extra win cause I can already taste them! You are so right — I NEED PANCAKES. These pancakes. Like right this minute. Hot diggity dee dog I was hooked at caramelized coconut sugar, YEAS! You’re right weekend pancakes are in order with maybe some mimosas on the side?! Have you ever considered baking your pancake batter in muffin tins? I’ve been on a huge muffin kick lately and I feel like this combo would make for one killer cinnamon swirl muffin. Mostly just curious if you think this is a possibility. I’m not really sure how muffin batter and pancake batter differs, but I think that sounds amazing. Hi Ashely, I’ve definitely thought about that!..but I’ve never tried it. Let me know if you give this recipe (or any other pancake recipe) a shot as muffins and thanks for the excellent idea! I LOVE LOVE LOVE pancakes. These look lovely. I really impressed with the golden brown color you achieved. Fun recipe. You have the best pancake recipes. I can’t wait for your ebook, my friend!! Ohmygoodness I cannot wait to make these! My jaw literally dropped when I saw the second picture, they look so delicious! These sound fantastic! I can hardly wait to try them. You had me at churro factory. I WANT THEM ALL IN MY MOWTH. My thoughts/feelings exactly! Let’s make eating pancakes our full-time job, mkay? Kay! My pup is looking at me with a tilted head since I am drooling… directly on to my keyboard. I really think you captured the spirit of churro with these. Crunchy on the outside, fluff on the inside, and they’re making me want to eat THE WHOLE PAN. Things could get dangerous. 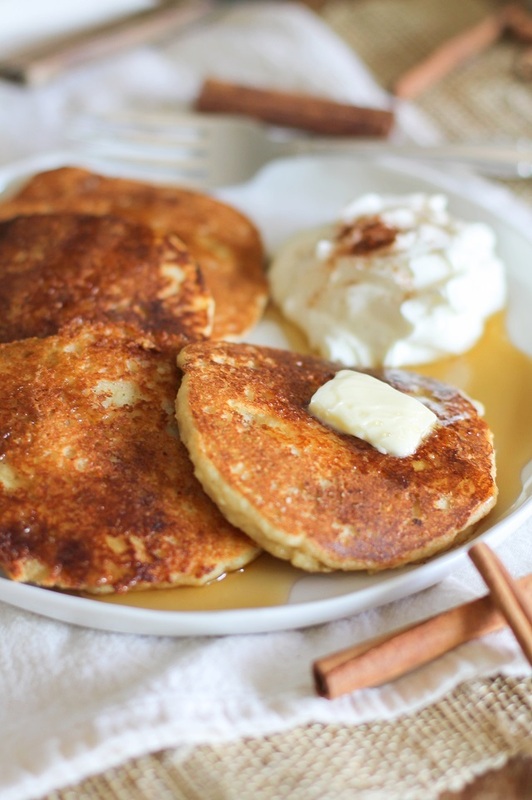 These pancakes look perfectly caramelized on the outside but oh so FLUFFY on the inside! I needz this in my belly. Are you kidding me? Those look absolutely delicious. I would cook some right now if it weren’t midnight. I’ve got a plan for in the morning now though, thanks! 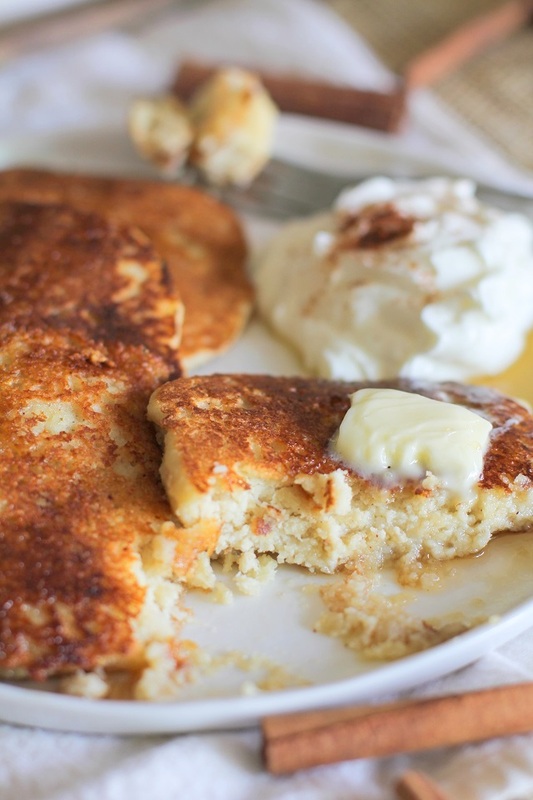 I definitely am making these paleo pancakes for this weekend’s breakfast. I love how healthy they are whilst still being so indulgent and delicious! YUUUUS! Let me know how you like ’em, lady! I so need these in my daily meal routine!! I could eat them for breakfast, lunch, and dinner!! I haven’t eaten pancakes forever, and these are making my mouth water and actually making me wish it was morning time so I could eat a huge stack of these! And the cinnamon swirl is genius!! What an inventive recipe with great potential! Not sure how many of you actually made these vs. just pinned them. I made them this morning. When I read the recipe I was thinking there wasn’t enough cinnamon and I was concerned that having just almond flour would make it heavy and dry. All assumptions were correct. I am not a novice cook/baker and my husband is a retired professional chef. I followed the recipe to a T but unfortunately, the batter was too thin, there was too little cinnamon, the swirl was too thin, and the pancakes were difficult to manage because they were crumbly, dry, and stuck to the pan, despite it being oiled, they fell apart. I think with some minor adjustments this recipe could be amazing, but as it stands now, it wasn’t. 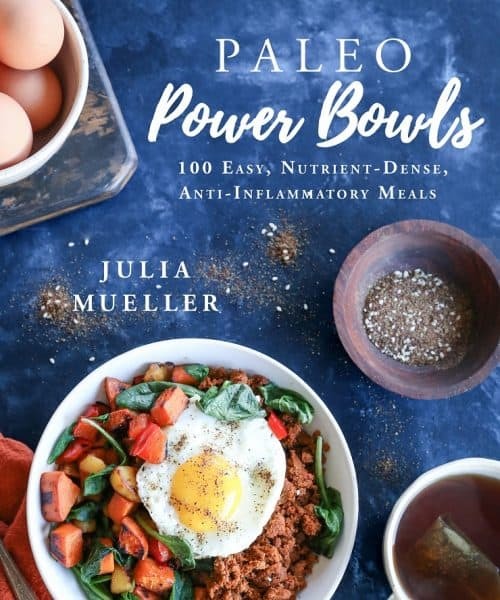 I hate to be the only one with less then positive comments, but I think it’s really important to post an honest review of these Paleo recipes because the ingredients are expensive and the preparation is time consuming. I will be making it again but with canned coconut milk instead of all almond milk, more cinnamon in the swirl, perhaps a few tablespoons of arrowroot flour, and I think it might be helpful to prepare the night before to soften the almond flour & thicken the batter. 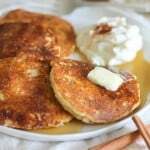 My son thought the flavor was better then other Paleo pancakes but didn’t like the texture, and my husband wouldn’t eat it. I really love your site and plan to try more of your recipes, hope this review isnt too discouraging, you really do have some creative cooking on here. Hi Tiffany, I liked your suggestions for the pancakes, so I remade them this morning, adding tapioca flour, and adjusting the liquid slightly. I also added some more cinnamon and loved the way they turned out. I have noted my changes in the recipe 🙂 The tapioca flour made the pancakes hold together better than the first time I made them, so I think you’ll find the updated version is easier to flip. Let me know if you try version 2.0 and thanks so much again for your feedback! Outstanding! I cannot wait to try them again! I almost Never read the lead up to the recipe, but you are hilarious and awesome. Thank you! I very rarely comment, but I believe this recipe deserves some praise. 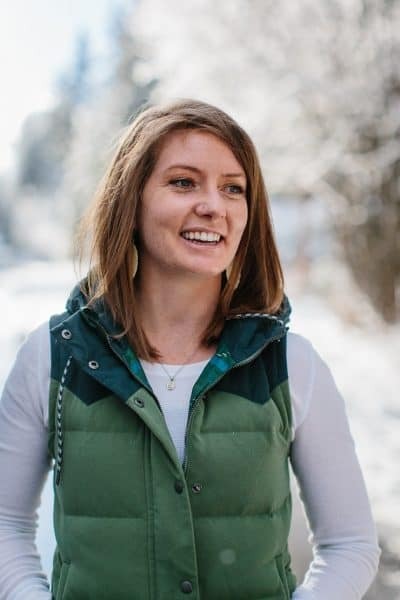 I got to your site from a pin, and was looking for something that would satisfy all the picky eaters in my household, as not everyone has joined me on my gluten-free journey.. The only change I made to the recipe was that I had some gluten free rice flour blend that I wanted to use up, so I used one cup of that and one cup of almond flour. Mine seemed a little thicker than it probably should’ve been, but they cooked up very well and the taste was spot on to your description. And everyone loved them!! I’m making these right now and I’m up to a half a gallon of almond milk because they are so thick! I don’t understand I followed the recipe to a T and was so excited to try these but they are like dough consistency. Oh no, I’m so sorry to hear that! Did you make any changes to the recipe? Specifically, did you change up the flour measurements or types at all? Hope your weekend is going well otherwise. Did you make any substitutions? What type and brand of almond flour and tapioca flour did you use? I’m sorry the pancakes didn’t turn out – sounds like the batter just needed more liquid. These pancakes were super thick for me. I had to add almond milk which then diluted the cinnamon flavor. I think I’ll try again but buy paleo pancake mix. I’m sorry to hear that, Aimee! What brand of almond flour did you use? Did you make any other substitutions (for instance, arrowroot flour for tapioca flour or coconut milk for almond milk)?